SanBio Co., Ltd. (representative: Keita Mori, headquarters: Chuo-ku, Tokyo; hereinafter SanBio) hereby announces that it has resolved to enter into an equity and business alliance (hereinafter the Agreement) with CareNet, Inc. (representative: Katsuhiro Fujii, headquarters: Chiyoda-ku, Tokyo; hereinafter CareNet), Medical Incubator Japan K.K., (representative: Jun Katsura, headquarters: Minato-ku, Tokyo; hereinafter Medical Incubator), Vital KSK Holdings, Inc. (representative: Taisuke Murai, headquarters: Setagaya-ku, Tokyo; hereinafter Vital KSK Holdings), and Astem Inc. (representative: Tsuguo Yoshimura, headquarters: Oita, Oita Prefecture; hereinafter Astem) for joint research on the appropriate use, adoption, and stable distribution of regenerative cell medicine SB623. Since the beginning of the 21st century, R&D of regenerative cell medicines has been actively promoted around the world, and as a result, has now reached the stage of products being approved and launched. Regenerative cell medicines are expected to spread widely in the coming years. However, medical institutions and peripheral companies in the healthcare industry including pharmaceutical distributors are largely inexperienced in the handling of regenerative cell medicines. They are currently under pressure to accelerate preparations for promoting and marketing regenerative medicine products in ways best suited to their features. Under such circumstances, the five companies above have been examining best ways to pioneer the appropriate use, adoption, and stale distribution of regenerative cell medicines in Japan. Because regenerative cell medicines are a cutting-edge field, the five companies agreed that appropriate use, adoption, and stable distribution of these medicines would be best achieved by teaming up with pioneers in each specialty, and hence agreed to conduct joint research. With its regenerative cell medicine SB623 as the research target, SanBio will engage in joint research with CareNet and Medical Incubator, which have many years’ experience in providing pharmaceutical information and educational programs for physicians and pharmacists, and with Vital KSK Holdings and Astem, which have knowledge and experience in pharmaceutical distribution. 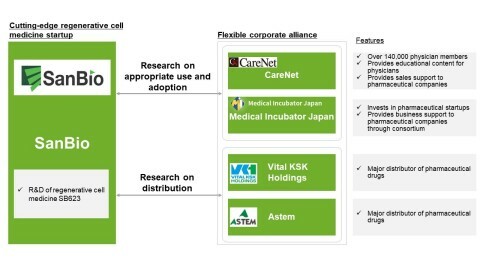 SanBio, CareNet, and Medical Incubator are to play a central role in research into the appropriate use and adoption of regenerative cell medicines, while SanBio, Vital KSK Holdings, and Astem will lead studies in distribution. By drawing on the knowledge and experience of each company, SanBio believes it can enhance the content and quality of joint research. Although the main goal of forming business alliance is to improve the content of joint research, the five companies have judged that they could also increase their corporate value by taking part in the alliance. Hence, to conduct the joint research in a more cooperative way and to make the best of their alliance, they have decided to enter into an equity alliance agreement. SanBio will acquire 1,076,400 common shares in CareNet held by its largest shareholder CareNet Innovation Investment Limited Partnership (hereinafter CareNet Innovation) in an off-market transfer (9.74% of 11,048,000 outstanding shares as of August 31, 2018). CareNet, Medical Incubator, Vital KSK Holdings, and Astem will acquire in total 1.59% of outstanding shares in SanBio (49,713,533 shares as of August 31, 2018). Medical Incubator will own shares in SanBio through CareNet Innovation, which Medical Incubator manages as a general partner. (1) Company name SanBio Co., Ltd.
Toru Kawanishi, Executive Chairman and Co-CEO of SanBio, owns 1.30% of outstanding shares in CareNet (as of June 30, 2018). Motoyasu Ohno, Chairman and CEO of CareNet, owns 0.26% of outstanding shares in SanBio (as of January 31, 2018). Business relationship Based on an outsourcing agreement concluded in the fiscal year ended in January 31, 2018, SanBio has outsourced post-market research of SB623 to CareNet. (1) Company name CareNet, Inc.
Business relationship Based on an outsourcing agreement, CareNet has received orders for market research from SanBio. Capital relationship CareNet Innovation owns 28.64% of outstanding shares in CareNet (as of June 30, 2018). Business relationship CareNet and CareNet Innovation have concluded an equity alliance agreement. Capital relationship Mitsuhiro Hata, Director of Medical Incubator, owns 0.75% of outstanding shares in CareNet (as of June 30, 2018). Medical Incubator owns 28.64% of outstanding shares in CareNet through CareNet Innovation, which Medical Incubator manages as a general partner (as of June 30, 2018). Personal relationship Motoyasu Ohno, Chairman and CEO of CareNet, was appointed as Chairman & Co-CEO of Medical Incubator. Business relationship CareNet and Medical Incubator have concluded a business alliance agreement and a consortium agreement. Capital relationship Vital-Net and KSK (subsidiaries of Vital KSK Holdings) respectively owns 3.72% and 2.48% of outstanding shares in CareNet (as of June 30, 2018). Capital relationship Astem owns 6.20% of outstanding shares in CareNet (as of June 30, 2018). Business relationship CareNet and Astem have concluded an agreement regarding cooperation on DVD sales. * Note: CareNet carried out a two-for-one stock split effective October 1, 2017. Net assets per share and net income per share were calculated based on the assumption that the stock split was carried out at the beginning of the fiscal year ended December 31, 2015. (3) Representative General partner: Millennium Partners Co., Ltd.
General partner: Medical Incubator Japan K.K. Business relationship CareNet Innovation and CareNet have concluded an equity alliance agreement. Capital relationship Medical Incubator owns 0.01% of interest in CareNet Innovation as a general partner. Personal relationship Medical Incubator is serving as the representative of CareNet Innovation as a general partner. Business relationship Medical Incubator executes business operations of CareNet Innovation as a general partner. Capital relationship Capital contributions from Vital-Net and KSK (subsidiaries of Vital KSK Holdings) account for 29.22% and 19.48%, respectively, of total capital in CareNet Innovation.